Social media has changed almost all facets of our society and criminal justice certainly has been no exception. It is now common to find Facebook messages and posts, Instagram pictures and Snapchat videos being entered as exhibits in just about any criminal trial. In some ways, this has assisted the truth-seeking function of the courts: so much more of our lives are now recorded in digital form, and that can make it easier to reconstruct past events with a greater degree of certainty. But social media is also fraught with the very real potential of distorting past events and our recollections of those events. Even those who witness something first-hand can have their memories warped and distorted by subsequent social media posts. The phenomenon of memory distortions resulting from suggestive propositions has been recognized since long before the rise of social media. In 1974, psychologists Elizabeth Loftus and John Palmer published the findings of their now famous study: Reconstruction of automobile destruction: An example of the interaction between language and memory. That study involved showing the participants footage of a traffic accident, and then asking them questions in a suggestive manner to determine whether or not the phrasing of the question would influence their answers. Group 1: How fast were the cars going when they contacted each other? Group 2: How fast were the cars going when they hit each other? Group 3: How fast were the cars going when they bumped each other? Group 4: How fast were the cars going when they collided with each other? Group 5: How fast were the cars going when they smashed into each other? What they found was that the verb used to qualify the impact influenced the answer given, with members of each of the above-mentioned groups reporting progressively higher speeds, even though all participants had seen the same video. Loftus and Palmer conducted another study where they showed 150 participants a video of a car accident. Similarly to the first study, they asked 50 of those participants how fast the cars were going when they “hit” each other, another 50 were asked how fast the cars were going when the “smashed into” each other, and the remaining 50 were not asked about how fast the cars were going at all. A week later, without being shown the video again, they were all asked if they remembered seeing broken glass in the video. The 50 who were suggested the cars “smashed into” each other were more than twice as likely to report seeing broken glass than those who were suggested the cars “hit” each other, who, in turn, were only two percent more likely than the control group to report having seen broken glass. The kicker? There was no broken glass in the video. It should be noted that the majority across all groups reported that they had not seen any broken glass (64% for the “smashed” group, 86% for the “hit” group and 88% for the control group). Nevertheless, the findings are statistically significant, and this study remains a mainstay of modern psychology. Furthermore, Elizabeth Loftus and other psychologists have continued to conduct compelling studies demonstrating the frailty and malleability of human memory. While cognizant of some of these frailties, courts continue to fall woefully short in terms of being mindful of these sort of findings when assessing the reliability of eyewitness testimony and properly instructing juries in cases that rely heavily on eyewitnesses, particularly in cases where suggestive comments or pictures have been put to witnesses after the fact. Nowadays, the sheer amount of information circulating and readily available has amplified the potential for suggestibility to a degree that is difficult to either quantify or qualify. If you witness a crime in a public place, there is a good chance someone will have posted something about it by the next day, and what we can draw from the Loftus and Palmer experiments is that there is also a significant possibility that that post will also influence your memory of the event. And just as police use social media platforms for investigative purposes, anyone with a Facebook, Twitter or Instagram account can fancy him or herself a modern-day Sherlock Holmes. Except that their investigation won’t be rooted in reasoning or science, it will be rooted in the social media gossip of the day. 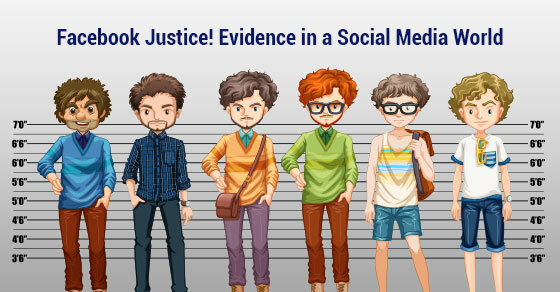 We were recently involved in a jury trial in which some of the perilous effects of social media on the criminal justice system took center stage. This was a case in which anywhere between six and nine individuals were alleged to have participated in an assault that resulted in a young man being sent to the hospital with a broken jaw and other serious injuries. However, of the six to nine men who were said to have partaken in the assault, ultimately only three were charged, and one of them had the charges against him dropped before the case got to trial because he had an alibi that police were able to verify. Furthermore, the identifications of all three suspects came from a single source: a young woman who had not personally witnessed the events in question. All she had witnessed was an earlier altercation between friends of hers and another group of people. She later found out that one of her friends had been involved in a subsequent physical confrontation and had ended up in the hospital with serious injuries, but did not witness this second confrontation first-hand. The next day, she came across a Snapchat video posted by another one of her friends who had not been present during any of the altercations, and thought she recognized one of the people in the video from the earlier altercation she had witnessed. At that moment, she decided to become the lead investigator in the case. She showed this video to those of her friends who had seen the second confrontation and suggested to them that one of the men in the video might have been one of those who participated in the attack. They discovered who this person was and looked him up on Facebook. From that Facebook profile, up pictures and identified two other individuals who they thought to have been part of the group who had assaulted their friend. Of these two additional people, one was originally described to police as a short blackmale with a baseball cap (the generality of which should not be lost on anyone). And lo and behold, what did they find on Facebook? A picture of the guy from the Snapchat video posing with a short black guy with a baseball cap! The problem was that that individual had an alibi that police later confirmed. He could show that he had not been there at the time of the assault, and police were satisfied by his account and by the evidence he had to corroborate his version of events, and before the case got to trial, all charges against him were dropped. Despite that, some of the witnesses remained convinced that he had been involved in the incident up until the trial- a good example of the frailty of human observation. Our client’s story was admittedly somewhat different. In addition to having been identified in Facebook pictures with the guy in the Snapchat video, he had been apprehended a short way from the scene in a bloodstained T-Shirt – not a great look for anyone. However, it turned out that none of that blood could be shown to be the victim’s. The only bloodstains that could be traced to anyone using DNA testing were traced to a single person: the guy from the Snapchat video – the same guy who was first identified by someone who didn’t actually see what had happened. Police often conduct photo line-ups to identify suspects. This involves showing a witness pictures of a number of people who correspond more or less to the description of a suspect along with a picture of the prime suspect police have in their sights. However, this procedure requires that the witnesses to whom the photos are shown not have had any prior exposure to pictures of people who are alleged to have participated in an offence between the time of the offence and the time the photo line-up is conducted. When prior exposure has occurred, it is broadly recognized (even by police departments) that conducting a photo line-up is a futile exercise fraught with risks of misidentification that could ultimately lead to a wrongful conviction. This is precisely why a photo line-up was not conducted in this case. But had it not been for the Facebook “line-up” that had been presented to the witnesses earlier by a vigilante social media detective, this would have been an easy case in which the police could have had the actual witnesses provide far more reliable identifications of the suspects by conducting a photo line-up. Instead, it was a case in which police were deprived of a crucial investigative tool because the memories of the people who had actually seen the suspects had been tampered with by the actions of someone who had not. While courts do exercise a degree of caution with respect to eyewitness testimony, be it in giving reasons for judgment or instructions to a jury, the scientific basis for that circumspection is seldom referenced, and that is problematic. When instructing jurors, there is a difference between simply cautioning the jury about the frailties of human memory and referencing specific studies that demonstrate that people are significantly more likely to have distorted memories of past events they have witnessed when suggestions about those events are put to them. Because courts do not have judicial notice of these sorts of studies, it is incumbent on us as defence counsel to bring hard evidence regarding the shortcomings of human recollection to the attention of the court whenever a case turns on eyewitness evidence. We cannot defer to judges or juries to simply make judgment calls, to trust their gut, and to go with the witness or witnesses they best believe. With the ever-growing ubiquity of social media, witnesses to criminal incidents are now more than ever at risk of being exposed to suggestive comments, photos and videos capable of influencing their memories of what and whom they saw. Consequently, urgency of the need for proper guidelines for triers of fact to assess what impact, if any, such exposure might have had on a witness’s recollection of past events cannot be overstated. If we fail to promptly establish such guidelines, we may well find ourselves on the doorstep of a dystopian world in which trials by social media mob, decided on the basis of warped and distorted memories become the hallmark of our criminal justice system.